Five-port gigabit switch accelerates your performance and productivity when you send large files to network servers, drives and printers. Wired connection speed up to 1,000 Mbps minimizes transfer times and interference while streaming high-bandwidth files. 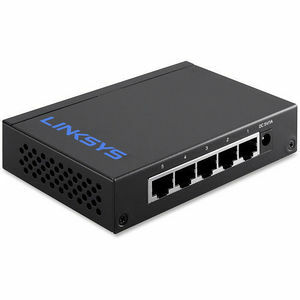 Plug-and-play technology instantly extends your office network with a quick, easy installation. Auto-sensing ports automatically optimize the speed for each connected device. The auto power-down feature disables unused ports to maximize its efficiency.